As “Cedar” is remarkable for its durability and permanent fragrance, the Cedar Group has marked the goal to spread the aroma of their commitment and conviction to define living spaces and lead to better lifestyles. · The highest imaginable standards for the welfare of its staff, society as well as for the environment. 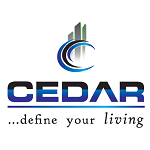 Our upcoming project launches –Cedar Luxurious with the basic concept of “sense of openness and freedom” through intelligent design and careful planning of varied lifestyle needs not just within the house also extending it to the environment. The company is managed by highly experienced professionals who are fully engrossed to ensure that the company maintains its high standards in quality construction, timely delivery and customer satisfaction. The company has always strived hard to keep its commitments and thus enjoys an extremely resonant reputation in the construction industry.